(Nanowerk News) Scientists at the University of Basel were able to identify for the first time a molecule responsible for the absorption of starlight in space: the positively charged Buckminsterfullerene, or so-called football molecule. Their results have been published in the current issue of Nature ("Laboratory confirmation of C60+ as the carrier of two diffuse interstellar bands"). 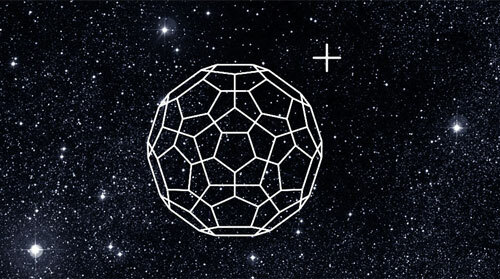 Ionized Buckminsterfullerene (C60+) is present at the gas-phase in space. Almost 100 years ago, astronomers discovered that the spectrum of star light arrived on earth with dark gaps, so-called interstellar bands. Ever since, researchers have been trying to find out which type of matter in space absorbs the light and is responsible for these “diffuse interstellar bands” (DIB) of which over 400 are known today. Astronomers have been suspecting for a while that big complex molecules and gaseous ions based on carbon could be absorbing the starlight. The Buckminsterfullerene is such a molecule: a structure made up of 60 carbon atoms shaped like a football that was first discovered in the mid-1980s. After this discovery, the questions arose if it was possible that the football molecule was in fact responsible for the DIB. The research team led by Prof. John P. Maier from the Department of Chemistry at the University of Basel has been studying the electronic absorption of the ionized Buckminsterfullerene since 1993. In fact, the spectrum measured in the lab did show absorption features at two wavelengths that were near two DIB that had been discovered by astronomers the following year. In order to obtain the spectrum in the laboratory using a diode laser, several thousand ionized Fullerenes were confined in a radiofrequency trap and cooled down by collisions with high density helium to very low temperatures of around 6 degree Kelvin – conditions very similar to outer space. The absorptions measured in the laboratory coincide exactly with the astronomical data, and have comparable bandwidths and relative intensities. This identifies for the first time two DIB and proves that ionized Buckminsterfullerene is present at the gas-phase in space. “This is remarkable, considering the complexity of this molecular ion and the presence of high-energy radiation in such an environment”, says Maier.